To look at the shelves of our bookshops you might think the mental well-being of the nation rests on an inexhaustible supply of felt-tip pens. The storming success of colouring-in books for adults, promising tranquillity and peace of mind as you colour, was the publishing triumph of 2015. But that was last year. Canny publishers are already looking to the next trend. So forget felt-tips: 2016 is the year of the fold. Colouring in is out; origami is in. Next month sees the publication of Zen Doodle Origami by Carolyn Scrace. In April, there will be a rush of titles: Colour-Gami: Colour and Fold Your Way to Calm; The Book of Mindful Origami: Fold Paper, Unfold Your Mind; and Zen Origami: 20 Modular Forms for Meditation and Calm. Some of these books come with sheets of origami paper, which you can colour in before folding them into a crane, a lotus flower or a Samurai helmet. There’s certainly a ready audience. The TED Talk (an online series of videos) on The Math and Magic of Origami, by origamist and mathematician Robert Lang, has been watched two million times. But can folding really bestow mindful calm? And can the new origami books replicate the runaway success of colouring in? 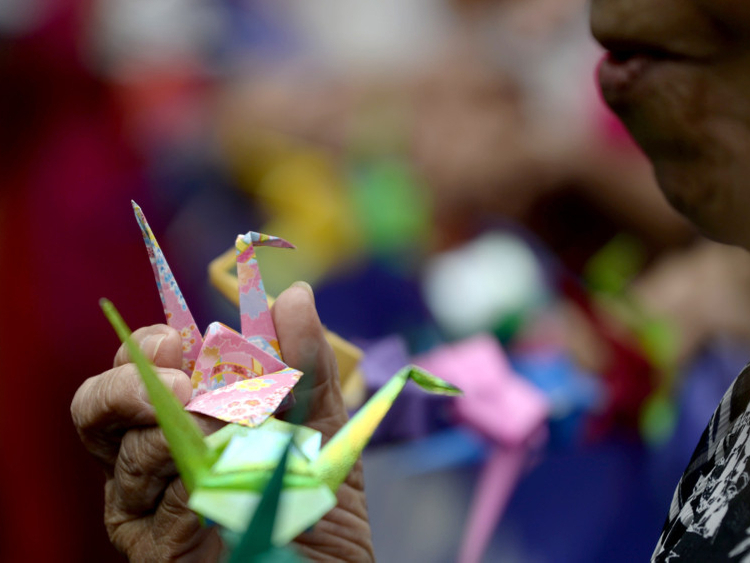 Origami originated in Japan in the 17th century, though there is also a flourishing paper-folding tradition in China. The principal is simple: three-dimensional shapes are made from folding a square of thin paper without scissor cuts or using glue. Mei Ling, who lives in Portsmouth, learnt the art of folding in China when she was seven years old. At her school, the boys would fold dozens of stars and put them in a jar to give to the girls they fancied. After moving to England, she worked as a nanny and babysitter, often teaching the children origami. When one mother asked her to make a series of origami models for a bare wall, she turned her babysitting game into a design business. “I think people find it calming during the learning process, memorising the steps and not thinking of other troubles at all,” she says. She listens to jazz as she folds. Others prefer meditative silence. Mark Bolitho has been folding for 35 years. His designs are more robustly masculine than the usual paper peacocks, butterflies and lotus blossoms. He has made lifelike triceratops and pterodactyl, and a jet fighter plane — a serious step up from the paper planes you may have thrown out of the window at school. He recalls attending a conference of origamists in Italy at which there was a peaceful hush. Origami is undoubtedly more challenging than colouring in. Its “masters” practise for decades. The most intricate folding instructions for models of praying mantises and armadillos are devised by mathematicians and can involve hundreds of intricate folds and creases. James Daunt, chief executive of Waterstones, wonders whether this will keep origami from capturing the same juggernaut market as colouring-in books. “It is addictive,” he says. “But I don’t know whether clumsy-fingered adults will take to it.” Still, he admits he did not predict the colouring-in phenomenon, so we may yet become a nation of folders. My own swan is swimming calmly on the surface of my desk, a stack of origami paper waiting next to it. For my next challenge, I have my eye on an easy penguin. But I think I’ll leave the armadillos to the masters.